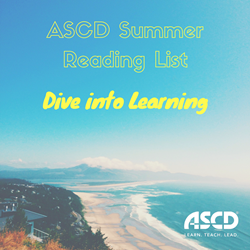 ASCD has released its 2016 summer reading list for educators. The books and publications featured on this list provide practical, evidence-based solutions for teachers and leaders as well as inspiration for a summer of top-notch learning to springboard educators of all roles and backgrounds into a successful 2016–17 school year. ASCD, a global community dedicated to excellence in learning, teaching, and leading, has released its 2016 summer reading list for educators. The books and publications featured on this list provide practical, evidence-based solutions for teachers and leaders as well as inspiration for a summer of top-notch learning to springboard educators of all roles and backgrounds into a successful 2016–17 school year. Each summer, ASCD provides a complimentary digital issue of its flagship magazine, Educational Leadership, as a bonus to its 135,000 subscribers and an opportunity for all educators to learn from industry-leading content. The latest issue tackles the topic of “How to Be a Change Agent” and features contributions from educators including ASCD authors Jeffrey Benson and Michael Murphy; 2015 National Teacher of the Year Shanna Peeples; and U.S. Department of Education teacher leader in residence Maddie Fennell. The contributors look at the complex situations our schools and the teaching profession face and ask, “What must we change?” and “How can we improve on what we do?” Educators can read the full issue at http://www.ascd.org/freesummerEL. The latest books from ASCD will support educators’ work in new ways and provide new ideas and strategies to add to their practice. Now That’s a Good Question! by Erik M. Francis―Educators will explore how one of the most fundamental instructional strategies—questioning—can provide the proper scaffolding to deepen student thinking, understanding, and application of knowledge. Teaching Students to Drive Their Brains by Donna Wilson and Marcus Conyers―In this book, educators will learn a practical way to teach preK–12 students how to drive their brains through metacognition by promoting practices that include adopting an optimistic outlook toward learning, setting goals, and monitoring progress. Cultivating Curiosity in K–12 Classrooms by Wendy L. Ostroff―This book, backed by relevant research from neuroscience and psychology, shows how to foster student curiosity through exploration, novelty, and play; questioning and critical thinking; and experimenting and problem solving. Literacy Unleashed by Bonnie D. Houck and Sandi Novak―School leaders will discover why ensuring high-quality reading instruction is one of their most important jobs and learn about the meticulously researched and refined Literacy Classroom Visit (LCV) Model that enables them to evaluate and improve literacy instruction in their schools or districts. These titles will provide inspiration and support the development of instructional leadership skills. The Principal 50 by Baruti K. Kafele―In this best seller, Kafele guides motivated school leaders through 50 self-reflection exercises designed to yield a deeper understanding of the meaning behind the work they do. Educators interested in critical questions for teachers to inspire classroom excellence can pre-order Kafele’s upcoming title, The Teacher 50. Leading with Focus by Mike Schmoker―This book is an essential resource for leaders who are ready to streamline their practice and focus their efforts on radically improving student learning. Aim High, Achieve More by Yvette Jackson and Veronica McDermott―This inspirational yet practical book will teach educators fearless leadership skills to bridge the divide that separates urban students from their birthright of a high-quality education. Tapping the Power of Personalized Learning by James Rickabaugh―This book presents step-by-step guidance for implementing a simple but powerful model for personalizing students' learning experiences―tried and rigorously tested in urban, suburban, and rural districts—by building their levels of commitment, ownership, and independence. Balanced Leadership for Powerful Learning by Bryan Goodwin and Greg Cameron with Heather Hein―The authors identify the 21 responsibilities associated with effective leadership and show how they relate to three overarching responsibilities: establishing focus, managing change, and developing a purposeful community. They then provide a step-by-step guide for leaders to navigate these areas on the way to transformational change. The books in this section will empower educators of all roles to make positive changes in their schools and engage every learner. Learning to Choose, Choosing to Learn by Mike Anderson―This teacher-friendly guide offers everything educators need to help students who are bored, frustrated, or underperforming come alive to learning through the fundamental power of choice. The Highly Effective Teacher by Jeff Marshall―Teachers will learn seven classroom-tested practices that foster student success, and get better at helping students develop deep understanding of content, attain higher-order thinking skills, and become secure, confident, and capable learners. How to Create a Culture of Achievement in Your School and Classroom by Douglas Fisher, Nancy Frey, and Ian Pumpian―The authors identify and describe five pillars that are crucial to building a culture of achievement and provide 19 action research tools that will help educators create such a culture, so that schools and classrooms are the best they can be. The Motivated Brain by Gayle Gregory and Martha Kaufeldt―Informed by new findings on the nature of the brain’s seeking system, the authors have identified key brain-friendly strategies for improving student motivation, knowledge acquisition, retention, and academic success. Teachers will learn how to harness the power of their students’ intrinsic motivation to make learning fun, engaging, and meaningful. These titles offer innovative uses of data and assessment that increase student motivation. Grading Smarter, Not Harder by Myron Dueck―This practical book―brimming with reproducible forms, templates, and real-life examples of effective grading solutions―provides assessment strategies that motivate students and help them learn. Rethinking Grading by Cathy Vatterott―This book will show all educators how standards-based grading can authentically reflect student progress and learning—and significantly improve both teaching and learning. How to Make Decisions with Different Kinds of Student Assessment Data by Susan M. Brookhart―With easy-to-understand explanations, supplemented by examples and scenarios from actual schools, this book offers a path to better understanding, more accurate interpretation of assessment results, and more effective use of data to improve teaching and learning. Teaching Students to Self-Assess by Starr Sackstein―Filled with practical tips, innovative ideas, and sample reflections from real students, this book shows teachers how to incorporate self-assessment and reflection in ways that encourage students to grow into mindful, receptive learners, ready to explore a fast-changing world. Starting School Right by Otis Kriegel―This book will help educators develop an authentic, effective, and thorough plan for the first week of school and set the stage for a successful year for students, parents, and themselves. Educators can visit this page to find more resources to drive summer learning, including the Summer Boost Webinar Series. Educators can visit http://www.ascd.org/apply to learn about the benefits of becoming an ASCD member.